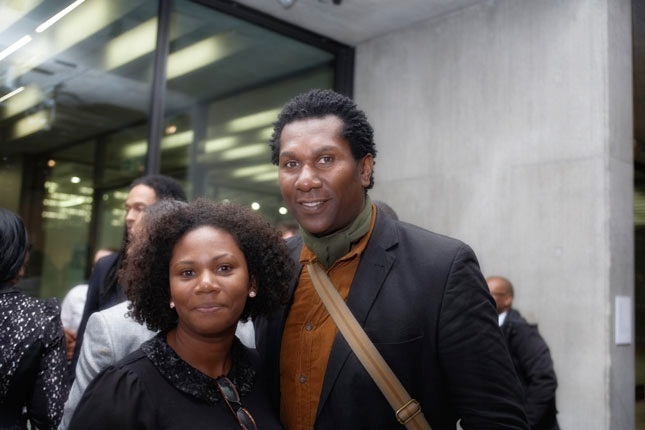 Yinka Shonibare MBE, creator of the famous Nelson’s Ship in Bottle that was displayed in Trafalgar Square, attended the private viewing of Happening To Be, an exhibition showcasing the work of accomplished black alumni of University of the Arts London, on October 17. The distinguished artist, who was a Turner Prize nominee in 2004, is featured in the stunning exhibition and he delighted audience members whilst enjoying the night’s entertainment. 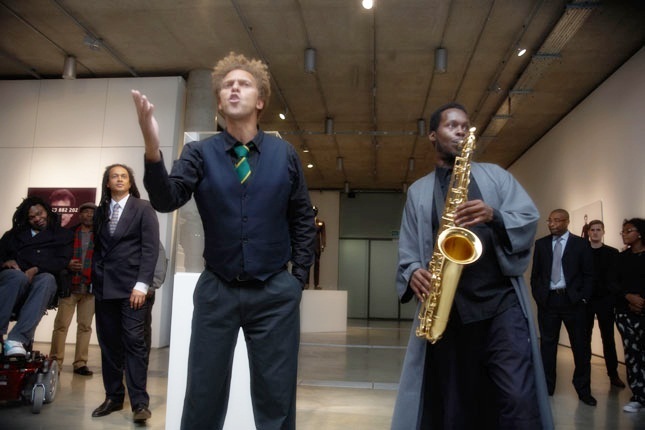 Leading saxophonist and composer Steve Williamson was joined by lawyer and spoken word artist David Neita in a dazzling performance of music and poetry. Happening To Be features the City Celebration painting by Professor Ablade Glover OBE, photo and video advertisements by Trevor Robinson CBE, suits by Saville Row master tailor Professor Andrew Ramroop MBE, who attended the press reception on September 28, and films by BAFTA award winner Ngozi Onwurah. Contemporary Sculptor Gary March, who created a sculpture for the Queen which is on display in St George’s Cathedral at Windsor Castle, was also in attendance. He was full of praise both for the exhibition, and the Shades of Noir movement, designed to address the degree attainment gap between black and minority ethnic and white home students. Shades of Noir founder Aisha Richards with sculptor Gary March. Happening To Be is part of a long-term project at University of the Arts London called Shades of Noir, founded by Lecturer and creative practitioner Aisha Richards in 2009 to improve outcomes for black and minority ethnic staff within arts higher education. The Happening To Be exhibition runs until October 27 2012 at Lethaby Gallery, Central Saint Martins College of Art and Design, Granary Building, 1 Granary Square, Kings Cross, London, N1C 4AA. Opening Times: Monday – Friday 10 am – 6 pm; Saturdays 10 am – 4 pm. Were you at the private viewing? How would you sum up the event? Have you been to the exhibition? Please leave your feedback below. Join the Shades Of Noir movement on Twitter and Facebook and visit the website for details of upcoming events.